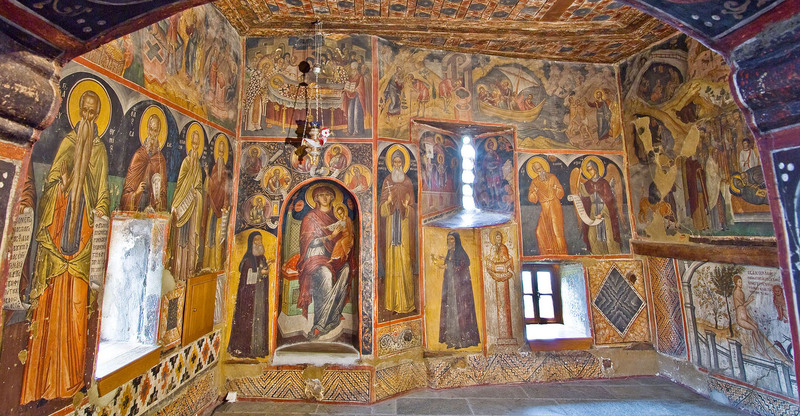 In October 1527, (in the year 7036 since the creation of the world), according to the building inscription over the entrance of the narthex towards the nave, the elegant Katholikon of the monastery was painted by the famous Cretan painter Theophanis Strelitzas the so-called Bathas. 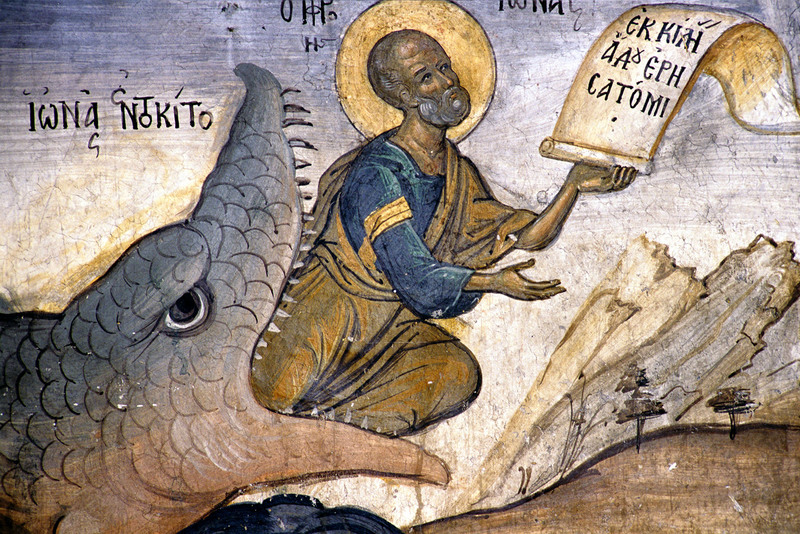 The painting of the Katholikon of the Monastery of St. Nicholaos Anapafsas is the oldest known work of the great painter and leader of the Cretan School “the best hagiographer” Theophanis, as his son characterized him on the inscription of the church of Virgin Mary in Kalabaka. 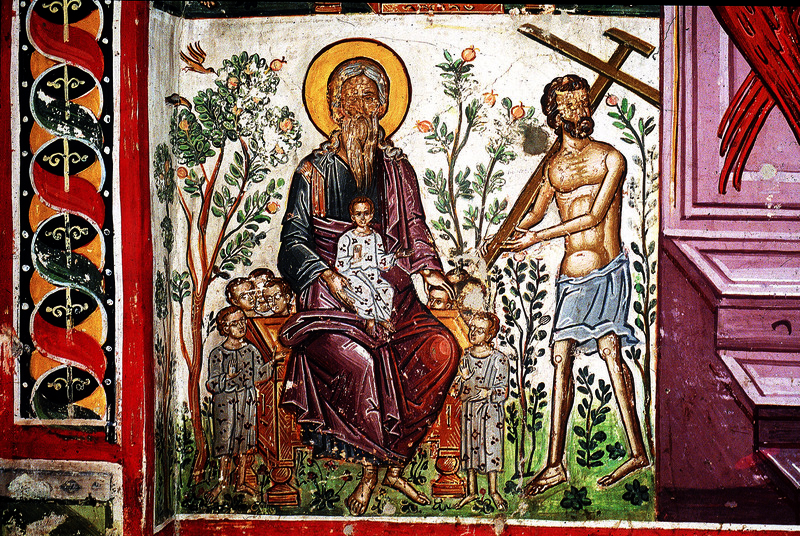 Perfect representations of full-bodied saints are in the narthex such as St. Ioannis of Climax, St. Pachomios talking to an angel, St. Antonios, St. Euthymios, St. Theodosios, St. Theophanis Graptos and many others. Below, flanked by the enthroned Virgin Mary (who holds the Holy Infant) and the saintly Athanasios the Meteoran, are depicted the Metropolitan of Larisa St. Dionisios Eleimon (on the left) and the Exarch of Stagoi deacon-monk Nikanor (on the right), dressed in monastic frocks. On the higher register we can see miracles performed by Jesus Christ (the cure of the dropsical, of the possessed of the blind man, of the paralytic and also the temptation of Christ in the desert, the wedding in Kana etc). 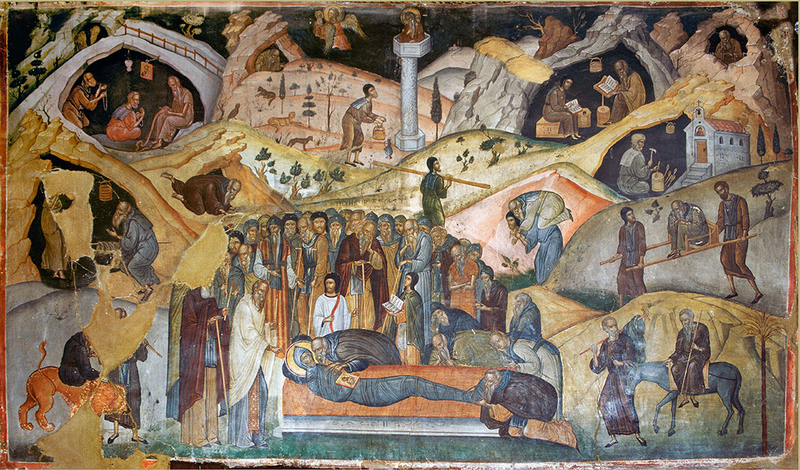 The imposing, many-figured compositions of the Second Coming, the Dormition of St. Efraim the Syrian and the Dormition of St. Nicholaos predominate the wall along with the representation of Adam in the garden of Eden where he names the birds and animals: “And Adam gave names to all the animals and all the birds of the sky and every beast of the fields” (Gen. 2.20). On the top of the dome of the nave predominates the figure of Pantokrator full of sweetness and compassion who is presented here as Jesus Christ the “Eleimon” (beneficent). On the first register right below the Pantokrator there is the representation of the Mass of the Angels and on the other zone the ten prophets with rotuli in their hands, where sayings concerning Christ are written. 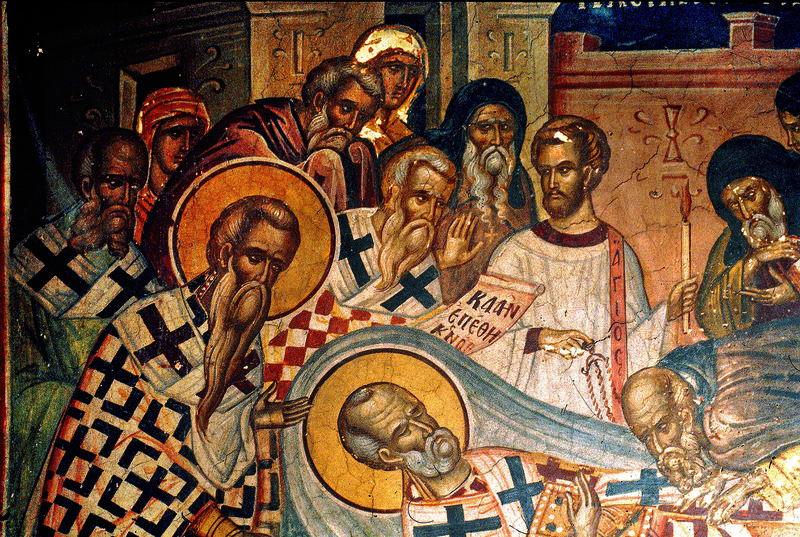 On the pendentives there is the regular depiction of the four Evangelists and on the lower register of the walls full-bodied military and other saints (Eustathios, Artemios, Nicholaos the young, Georgios, Dimitrios, Nestor, Theodoros of Tira, Theodoros the Stratelates, Konstantinos and Heleni, the Archangels Michael and Gabriel, St. NIcholaos from Myra etc). Above this zone there are busts of saints, scenes from the Dodekaorton and the Passions of our Lord (the Annunciation, the Assumption, the Nativity, the Baptism, the Purification, the Palm-Bearer, the Last Supper, Peter’s denial, the Betrayal, the Whipping, the Mocking, the Crucifixion, the Ressurection etc). Of exquisite artistry is the illustration on the sanctuary apse of the Christ Man of Sorrows. Undoubtedly the painting of the katholikon of this small monastery bears the stamp of the great Cretan painter Theophanis, with all the characteristics of his magnificent work that is vividness, nobility, plasticity, light bright tones and in general high quality in sketching and performance of colors in figures, characteristics with finally chrystalized on the extended wall-painting assemblages of his maturity in the Monasteries of Megisti Lavra (katholikon 1535/1541) and Stavronikita (1545/1546) in Mount Athos.